Clear away clutter and reveal the design you have in mind. Principal organizer Janet Flint offers practical solutions for any budget and timeline. Serving East Bay homes and offices since 2012, we help make sustainable changes in the flow of paper, goods and gear, making space for what’s important today, beautifully preserving historical keepsakes. Form and function are priorities as we find simple systems that work. 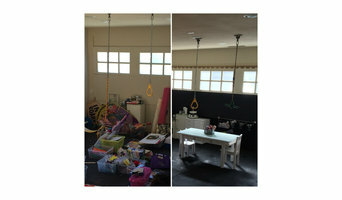 So how does one begin a downsizing and decluttering project? Janet Flint brings career experience in urban planning and office management to managing your projects: from re-purposing a room to reclaiming a garage or orchestrating a move. Cathy R. said: “You did a wonderful job of helping my husband and me declutter, organize and prepare for a huge move. After 20 years of accumulating, getting through all the "saved" clothes, books, dishes, keepsakes and 'what-not' was a truly daunting task. You provided consistent focus, skill and an always positive attitude. Now that we are finally in our new home, I am enjoying how spacious it feels- Huge thanks, Janet!” Steve E. offered” “Janet is a true professional. She got things done, on time, kept me on track, all with a very personal and friendly touch. I work long hours, have a busy personal life. I needed a design-eye and can-do approach, and Janet clearly delivered and actually made it fun.” Move your creativity to front and center. Clearing spaces, blending households, sorting through memorabilia, it all takes time, and the results can be liberating. Call us for an initial phone consultation and strategy session. We can help you reinvent your interiors to reflect your current passions. Get your home sparkling clean done quickly and efficiently! We understand how important it is to feel confident and worry free when it comes to the privacy of your home! The professional referred to you is prepared for any unique requests or special concerns our clients may have. Is your goal to simplify your life and enjoy a welcoming, organized home or work space? Allow RNPO to assist you with this life changing experience. Whether your need is to conquer the clutter, de-stress the mess, downsize, reorganize or relocate. I partner with you to develop customized solutions and hands on assistance to bring organization, peace and simplicity to your home or work space. Its time to reclaim control of your space. RayeNottieOrganizing.com ENJOY LIFE SIMPLIFIED!